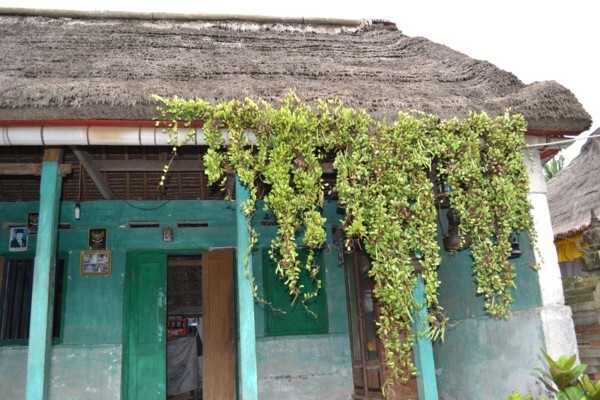 Our next stop, and not too much of a drive away was a traditional Balinese home and Moh told us that nobody knew how old it was but probably a couple of hundred years. It had been preserved by the government and was interesting to look around. 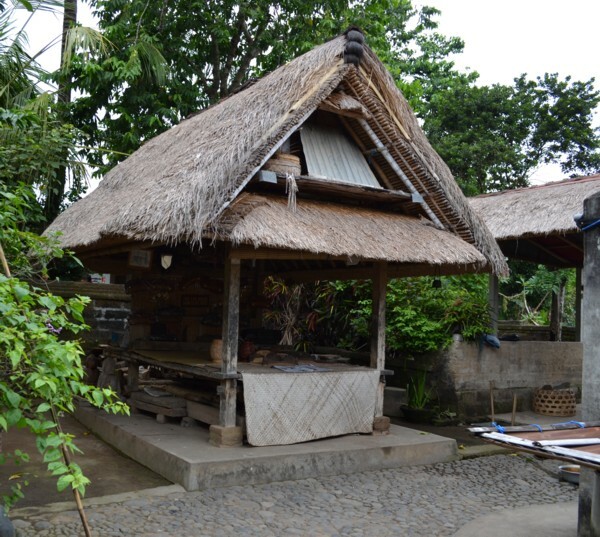 Balinese homes were a group of small, separate rooms. And why not when you live in such tropically warm weather? As we entered the gate there was a small wall and we went to the right of it ‘for blessings’ and apparently you leave ‘to the right’ for the same reason – though we didn’t, Moh went to the left! 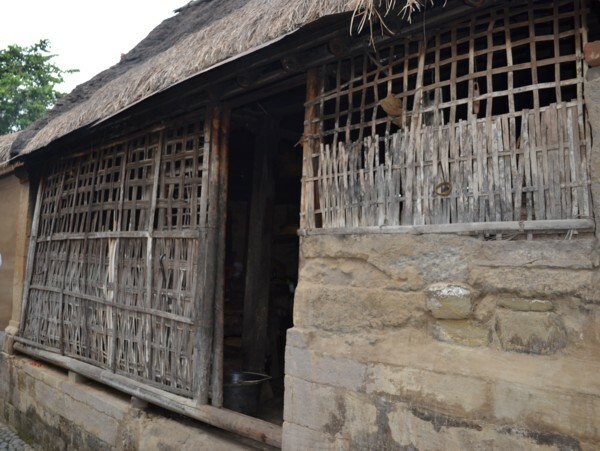 Each of the ‘rooms’ were small huts with thatched rooves made of dried grasses. Most were open sided but one was made of large sand coloured blocks for part of its walls and some woven substance that was either very thin wood slats or dried leaves. This was the kitchen, and inside was a fire burning in a large stone block setup. Other huts were for different purposes but for once Mrs I-Love-Facts wasn’t listening properly and was absorbed in my camera. I did hear that one hut was for the family head who seemed to live fairly separately from the rest. There was a very deep well towards the back of the grouping which was only covered by a piece of board that Moh lifted up. I shone my little torch down there but it didn’t shine on anything. I’m presuming this ‘room’ was the bedroom because the whole thing has only a raised platform. I guess it could be a large dining table!?! Not sure if you can see what’s inside the door of this one. Guessing that’s not traditional LOL I loved the roof garden though!!! There was also a lovely temple area. Moh told us that each extended family group has a temple and we had certainly seen a lot of these as we drove around. Many of the statues and structures in the temples, as well as some of the ‘wise old trees’ that we’d passed along the roads had black and white checked fabric tied around them but Moh said that it was a special ceremony tomorrow so the cloths would all be changing to yellow. Sure enough we could see this happening as we drove around – beautiful sunny yellow everywhere. David asked if the black and white was for a celebration but apparently that was the everyday colour. All of these family temples were walled areas with very small roofed structures inside (not a good description, sorry!) You can see the gateway here behind (OK in front of LOL) David with the carved stone decorations on top. There is also a black and white check adorned creature on the right of the gateway. Check out the orchid on the left and the staghorn/elkhorn around the tree trunk on the right! If you’re very keen you can see the little thatched rooves above 2 yellow cloths above Moh’s head, plus the larger roof behind the orchid was a part of the temple as well. All temples had step/s up and then down as you went through the gateway. After this we drove through several villages – I could almost never tell where one ended and the next began, it all seemed populated to me. But out here in what I’ll call the suburbs, or at least the ‘not city’, it became obvious that each village had its craft speciality. 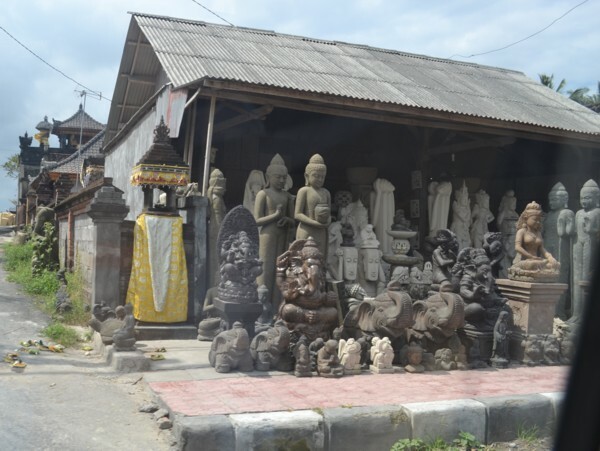 We drove along roads lined with countless carved stone shops such as this one. Hundreds of them! Well probably about 50, all overflowing with stock. We wondered who bought it all and Moh said mostly importers from other countries would come and buy a whole crate load. There were villages who painted art, villages who made jewellery and villages who made clay roof tiles. It was so strange to see these ‘shops’ with a pile of tiles out the front for sale. To make an Australian home you’d have to buy out the entire stock of several shops but they all looked as if they would go together nicely. All apparently cast from identical moulds. 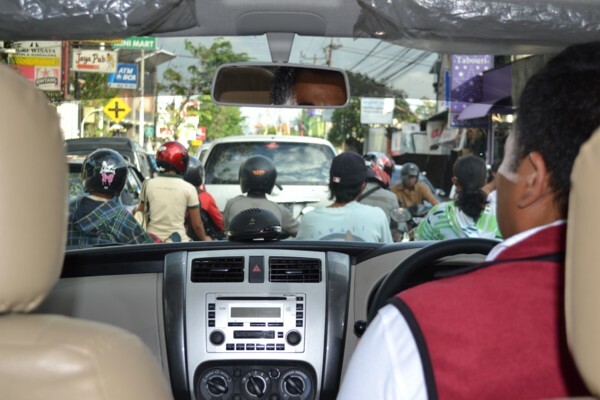 Soon we were driving through the streets of Ubud, which was definitely starting to look rather Western styled. Shops with glass windows rather than just open frontages lined this street and many tourists were walking along. Or climbing in some cases, as part of the road was quite steep! Moh drove through here – I must add that he was always telling us that he would happily stop anywhere if we wanted to! – but on the other side of the town he stopped to let us out at a palace. Outside the palace was an incredibly tall bamboo structure, probably about 3 or 4 floors high and not yet finished, and it seems that this was to be a traditional burial pyre for a royal family member who had died 2 months previously. Yes, 2 months! I’m trying not to think about that in this moist climate! It would be carried by hundreds of people in a large ceremony. As it was, still being assembled, it was in the street and robbing visitors of a great many parking spots. Not that I’m moaning, just observing. Moh dropped us off so that we could look at the palace while he went to see if he could park somewhere. The ‘palace’ obviously had other parts as all we actually saw was a large, paved, temple-style courtyard. There was one door in a wall that said no entry – or words to that effect – so we presume that lead somewhere more official and/or living quarters. Where we stood had very little to keep us occupied but I did take some photos that I was very happy with. One in particular. What a gorgeous wall. How much character has this got!!! The orange part above was the side of the wall that we couldn’t go. Just as Moh came into the courtyard we were turning to leave so he went to get the car. We stood in the street until he came for us and once we were in the car he asked if we wanted lunch. 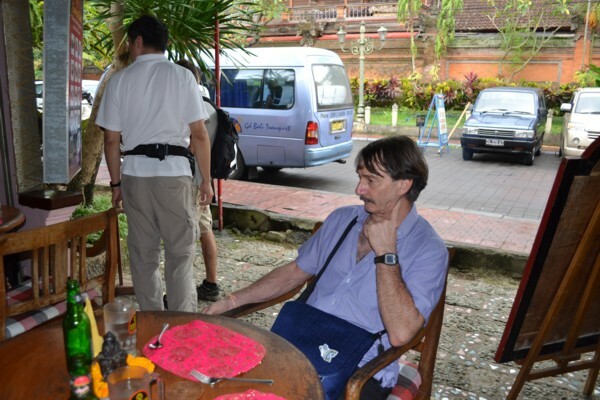 He was offering Balinese or Western cuisines and David answered that he wanted to eat somewhere safe. I think Moh was a bit taken aback by this but had misunderstood – David only meant safe for our tummies! I asked if there was anywhere that did vegetarian. He had to stop and think but basically made a U-turn and went back the few yards to where we’d just come from. He then left the car in the middle of the street while he went into a restaurant to see if they had a free table for us and it seems they soon would so we got out of the car having done no more than cross the street from the palace tee hee! The restaurant was called Bumbu and served Indian. I don’t quite know what to do about describing the restaurant to you. Uummmm. Well I guess all I can do is be truthful and tell it the way I saw it through my Western eyes. Here’s David seated at our table and we were on the entry corner of it. You can see how we’d had to step up a kerb and then down into a wide gutter and then up a small step into the restaurant, which was actually a courtyard with a bit of a roof over it. Most of the restaurant was taken up with a cooking class which seemed a very poor use of potentially revenue-raising tables. They turned away several people while we ate and we were surprised the class hadn’t been taught earlier or later to avoid lunch hour. There were only 4 or 5 small tables that people could sit and eat at. The menu was very good and varied and I chose pumpkin and ginger soup and also some potato skins. I think David got a curry but can’t clearly remember. We also ordered a pear cider each and laughed when we got them to see that they’d come from Perth! I suppose it was the placemats that made me laugh about the decor. As you can see they were bright pink and the pattern was done with an elaborate gold thread but they’d been really roughly, and badly, hemmed! It would have looked much nicer without any placemats at all and it’s not as if the wood of the tables needed protection. But the food was very nice. Very small portions, but delicious, and what more could you ask? After we’d eaten, David asked if there was a loo and it was around in the back corner of the building that the kitchen was in the front of. Very basic, in a large otherwise empty room, and the hand basin was outside in the open air but it served the purpose and was sure nicer than the batik shop! It also asked for a donation in a box but not having any coins and having said ‘keep the change’ for the meal we sidled away without donating. Again Moh hung back and left us briefly at the kerb so perhaps was getting a little something for delivering us here too. He soon scuttled away to get the car though and we were on our way once more. I rather got the impression we’d been too long and he was a little worried about the rest of the itinerary but he was certainly not forward about it. Left and right we went along roads that turned to miss paddy fields and there was one Western-sized 2-storey home in the middle of nowhere which was quite a surprise. A few roads were quite steep and then there was forest on the left of us and it seems this was the Monkey Forest but we declined stopping there. The tales of biting, scratching, rabid monkeys managed to dull the desire to any photos I might take. We’d ignored all other tales of woe from our homeland but this one seemed worth listening to. 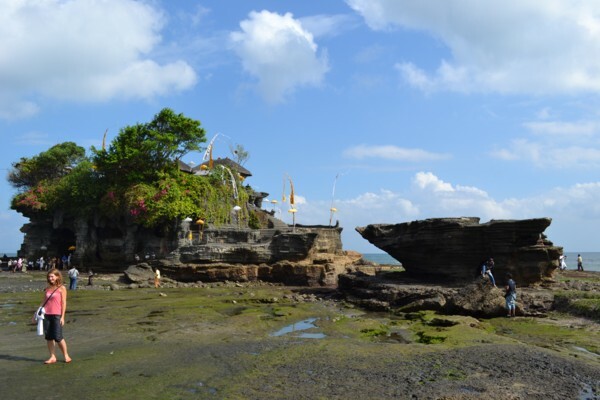 The next drive was quite a long way but Moh told us that we would be going to Tanah Lot – an ancient temple. Perhaps now would be a good time to say that we had not told Moh what we wanted to see. He had told us on Wednesday that he could plan an itinerary for us so when he picked us up we just let him do what he’d planned. There was an entry fee at Tanah Lot for the car and for once he turned to us to pay it which was fair enough. 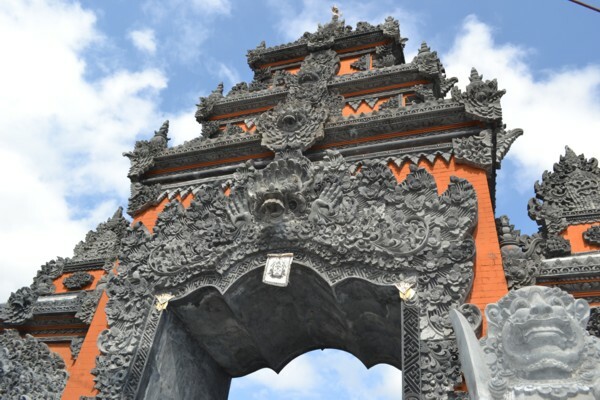 Then he talked about the temple and waved us towards a large ornate gateway and said he’d be there when we got back and please only be about half an hour or we’d miss the sunset at Kuta beach. We could have stayed here and seen the sunset but then we wouldn’t be able to see Kuta, and we didn’t know what we’d be missing. 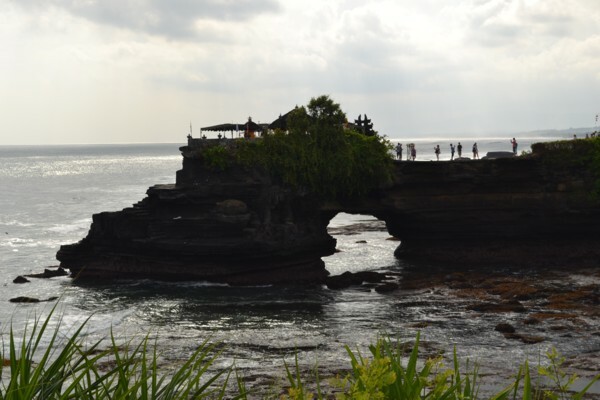 Here’s the top of the gateway into Tanah Lot. The only way to photograph the whole thing was to include some fat and ugly electricity wires so I’ve stuck with the ornate view. We were rather confused as to what we were doing here and what we were supposed to see, never mind where we were supposed to go! Once through the gate we were stuck in some markets which is exactly what we do not thrive on in Barter Land. We walked down the centre trying not to glance left or right. There were many signs saying ‘Toilets’ with arrows down laneways between the stalls but we considered this a fund-raising venture and expected tin buckets with curtains around. There cannot have been that many toilets there – not even the floor squat kind! We were gently accosted by several stall-holders but none with any gusto other than a boy of about 8 walking around with some pencil-looking things in his hands that had some decorations on the top. The only word for him was miserable but I say that sadly. He begged us several times to buy but we continued to say no thank you. We both wish we’d said yes or just given him some money but being good parents we’ve always stuck with our no once we’ve said it. This would have been a time not to do that in hind sight. Though thankfully he was not skin and bone or dressed in rags. He looked healthy. We kept walking and eventually came to a way out of the markets that was down a hill. There was a grassed area and a sign saying something about seeing a snake. Moh had said that we could see the black and white snake circling the temple but we hadn’t known what he meant and with so little time we really couldn’t go and look. As we continued down the hill we finally saw something hopeful. There was a large expanse of flat rocks just crawling with tourists and beyond that was a building on a higher part of rock that would have to be the temple. Whew! David was immediately accosted by a woman selling a whole bundle of photographic postcards for 20,000 but we told her “Later” and managed to convince her to let go. The tide must come up a long way to isolate that, but we have the postcards to prove that it does because David did indeed buy them on the way back. We told her 15,000 was all we had – that’s our pathetic way of bargaining, and she accepted. After this we turned left and came across a much prettier bit though there seemed quite a few people there also. We didn’t have the time to go and look at it so I just took a photo. We climbed back up the hill but this time to the left to try to avoid the markets and were a bit worried we were getting lost for a while but not only did we manage to get back to the carpark but we found some fairly decent loos on the way as well. However, coming from the back like that we had caught Moh on the hop and he was nowhere to be found. Probably down at the temple getting his cut from the postcard seller and asking at every market stall in case we’d made a purchase. Stop it. Naughty May!!! Just as well we’d found some toilets though. Kuta, a mere 22 kms away, took 2 hours to get to. On the 2 days that we went out on the roads we hardly drank anything because the toilets were nowhere to be found, it was dreadful. On one occasion David had asked Moh for a loo as we were driving and he’d had to take all sorts of backstreets and taken about 15 minutes to find a garage! Not like home where you can use any shopping centre (which are 2 a penny), garage or takeaway food place. But I’m side-tracked again. 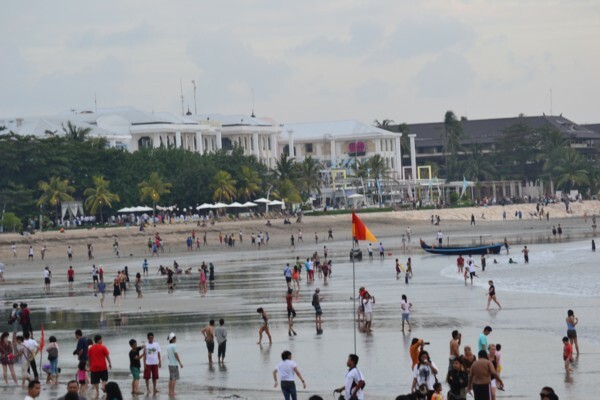 The main strip of Kuta was, to us, a nightmare. The cars and bikes moved so slowly down the narrow road that we truly could have walked faster. Here’s the view from the back seat. If you love shopping and bartering then I can see Kuta’s popularity but we don’t enjoy either of those things so it just looked like big city congestion without the high-rise and a big waste of time. 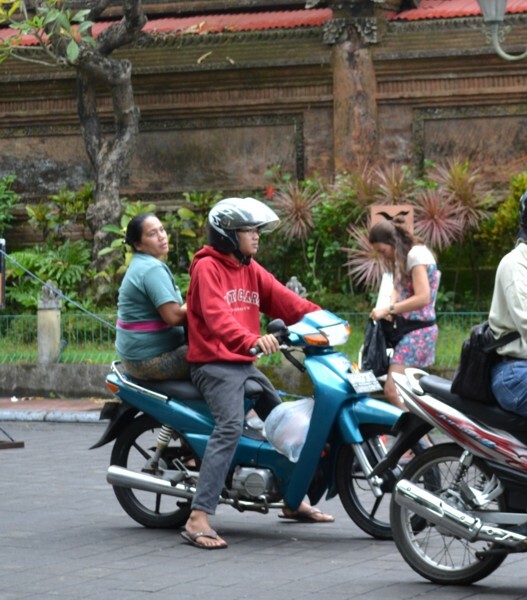 Now here’s how to load a motorbike!!! It was travelling, as best as traffic would allow, along the road. Finally we got through all the traffic and got a parking spot outside the walled beach. Even that was interesting in that it was angle parking but 2 cars deep! That meant Moh had to stay with the vehicle in case the car in front of him wanted to get out! He directed us to one of the few gateways in the wall so that we could go onto the beach in plenty of time for sunset and we dutifully went through. 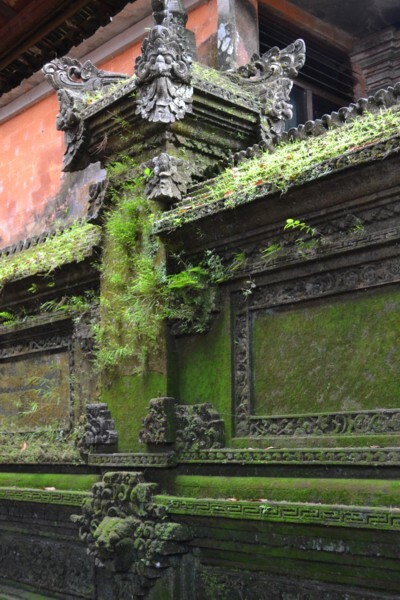 We also found out what happens when you make people enter a Balinese location through narrow doorways. They get pounced on by hawkers. “You want massage?” “You buy dress?” NOoooooooo!!! What we actually wanted was a nice clean bathroom and we headed towards a building that I had noticed from the car. Well, a roof over the wall anyway. I could smell it long before we were close enough to see it well so we decided that the Hard Rock Café that we’d seen from the car sounded like the best idea all day. We were the only people in there. I guess they mostly get an evening clientele, and they seemed incredulous that we only wanted coffee and not a meal. Truth was of course that we only wanted a loo and were buying coffee to be polite! We placed our order and then the manager came and sat at our table. David asked him where the loo was but I was then left to chat even after David had returned. Then David was rushing me with my very hot cuppa in case we missed the sunset that we didn’t even want to see. We can watch the sun go down over the ocean any day of the week or year just 5 minutes’ drive from our own front door. 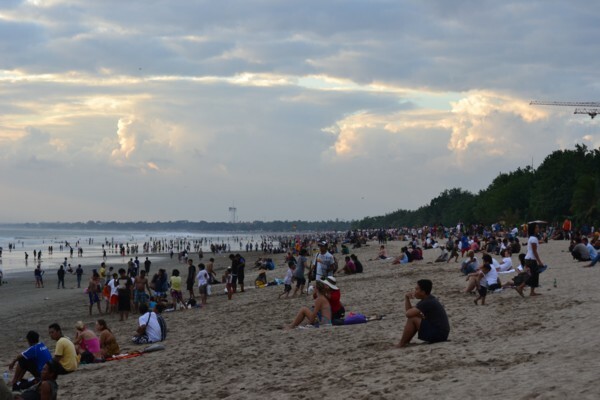 And here’s Kuta Beach to the right… Far too populated. Wow! And although we stood stock still for the whole 45 minutes we were down there (thanks David, I could have enjoyed my coffee instead of burning my tongue!) the hawkers came to us. One sneaky-looking character came up to us with the classic wooden box, slyly looked left and right before opening it up for us to see watches. Brand name, of course! ROFL. Took a bit of convincing we didn’t want a Cartier watch for five bucks Australian but well, we just didn’t! We were also offered ice creams and I actually wouldn’t have minded one but our ‘No’ was so habit now that I said no to that too. The thing that totally stunned us was that we were several times offered to buy… arrows. I’m talking bow and arrow-style arrows. What, by all that’s sacred were we supposed to do with those? Take pot shots at other beach-dwellers? We are as bewildered by it now as we were then but it made me wonder if I should keep my head low I can tell you! 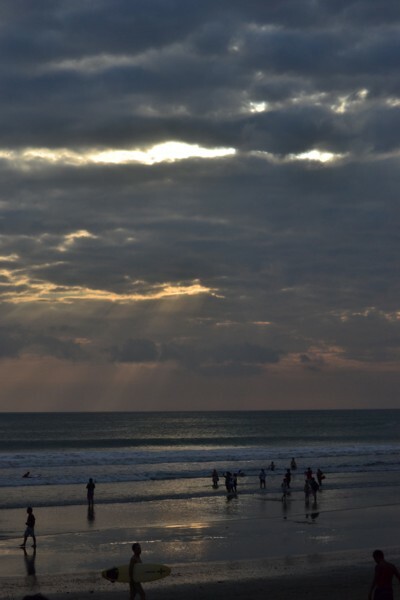 And so, eventually, the sun began to sink behind a whopping great bank of clouds and this is about as good a picture as I took LOL Moh appeared as if by magic, as he always did, other than the Tanah Lot episode. And home we went to Club Med with all good wishes to Moh for his future and from him to us. He urged us to share his number with any family or friends who are going over which is why I put his phone number on here on an earlier page. After our very small lunch, dinner was most welcome but David took the mickey of the tasteless desserts something shocking saying “This one tastes like a bucket-of-water”. “Aaaannd this one tastes like a bucket of soapy water!” And of course I was laughing myself stupid and encouraging him. After this was a ‘fire show’ by the pool. I have to say that I did not see much of it because the after-dinner snack in the bar was pancakes and after the taste-free desserts I sure did want one. This time I did ask David if he’d get one for me and for once in my life he wouldn’t so I had to queue up myself. Had the woman in front of me not wanted 6 pancakes on 6 plates I’d have got to see the fire show but David said it was not much cop anyway. We’d seen way better in Hawaii and in Singapore. It was fire as in fire-eating and fire-twirling and only lasted about 10 minutes or so. And that was that for another day and our bed was calling. You are amazing me with your ability to read the Bali and Kuala Lumpur stories at the same time as being at work and messaging me on DA ROFL At least my age huh? Cheeky whatnot – ggrrrrr 🙂 You watch out for those mad drivers, eat healthily and exercise and you’ll definitely get to be old like me *hug* Glad that I made you laugh. I love shopping—-especially in market places and boot sales. I had the time of my life in the souks in Marrekesh, and haggling just adds to the fun!! Each to his own–eh??? Yes, each to their own for sure. We’re afraid that someone’s gunna get ripped off – them or us – and either way we’re not at peace with that.